A few days ago we discussed NEA's closed-end strips, of which the most popular were their Christmas specials. Here is a Christmas strip from another syndicate, Associated Press. 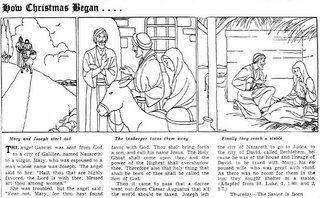 How Christmas Began was the AP's 1951 entry; they published one every year (or almost every - I haven't found them all ... yet). The art on this one is by Sylvia Sneidman, the story is uncredited. It may look like Sylvia didn't know how to spot her blacks, but in fact the editorial matter suggests that the kids can have loads of fun coloring the pictures, so that's why everything is done in simple outlines. This one was a real shorty - it ran from 12/20 - 12/25/1951. 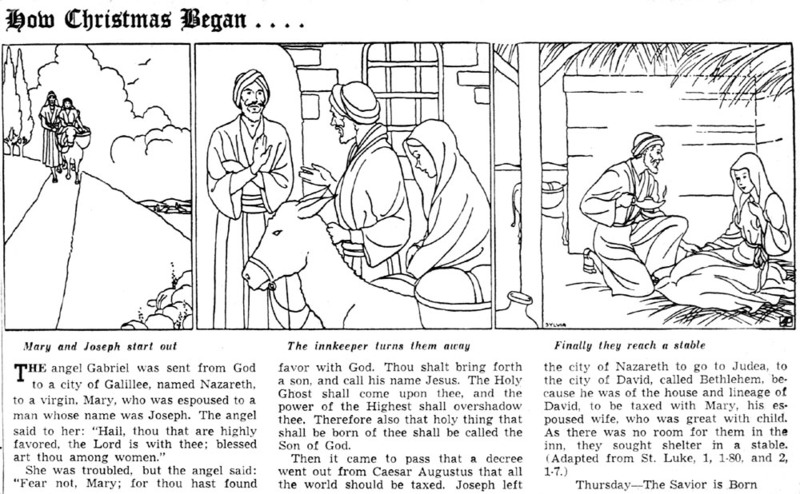 Most Christmas strips are on the order of three weeks long. C.D. 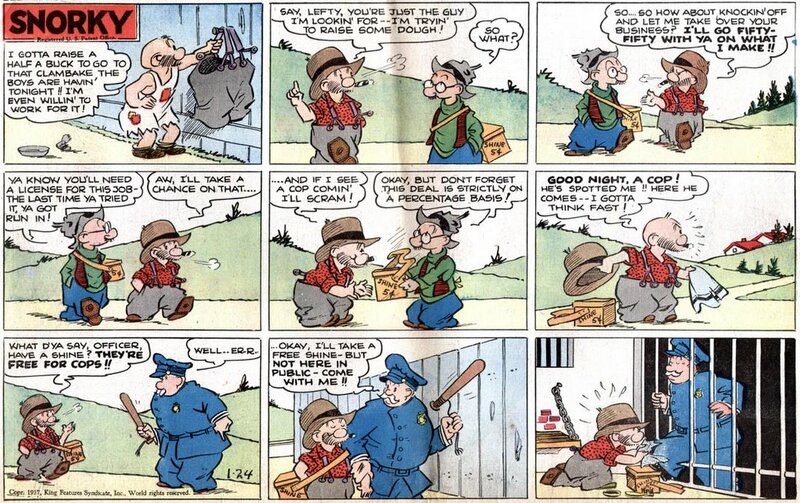 Russell's wonderful Pete The Tramp went through a trio of topper strips on its Sunday pages. 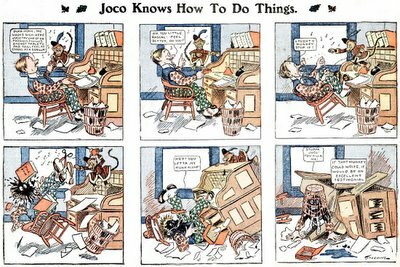 The first, Pete's Pup, was a dog strip, sort of a canine counterpart to the Mutt And Jeff topper Cicero's Cat. The next was The Topper Twins, my favorite because the name is an in-joke to the industry term 'topper'. For some reason, Russell alternatively called this strip The Tucker Twins. The last topper was Snorky, of which we have a sample today. It started in 1935, and is believed to have run as late as 1939. Getting an end date on these later toppers can be a Herculean task, because fewer and fewer papers printed the toppers as the decade of the 1930s wore on. In fact I have no examples of Snorky later than 1937 in my collection - the 1939 date is based on the strip's listing in the E&P yearbooks. It is a popular assumption in newspaper strip fan circles that World War II is what killed the toppers. I'll grant you that it was the coup de grace, but toppers were on the wane well before then. 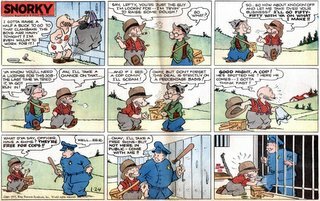 1935 seems to be the last year when toppers are truly ubiquitous, and thereafter many papers started dropping them in favor of half-page versions of the A-list strips. Toppers become decidedly rare as of about 1940, though many cartoonists kept producing them long thereafter. Some later toppers are so rare as to make one wonder if they ever actually ran in any newspaper - the only evidence I've found of some is on original art. Can anyone supply a definitive end date on Snorky? * above you see the Blade Winters Sunday for 2/22/53. This was the last installment in the only two papers I've found that ran it this long. But the storyline is obviously in full swing. Does anyone know of later ones? Also regarding Blade Winters, why would the writer change (from Lafe Thomas to Ed Jurist) on the last few weeks of the strip? * Betty by C.A. Voight. This great pretty girl strip ended on 4/6/1930 after a run of over a decade. When the strip came to a halt it was still in plenty of papers. Then, over six years later, on 11/1/36, the strip reappeared and ran another 7 years. Anyone know why the hiatus? * Similar question about Mortimer by Crawford Young. After running in 1929-30 it disappeared, then came back in 1935 for one more year. Why? * Coming into modern times, why did Greg Howard leave the Sally Forth strip in 1998? * What happened to the TV show spin-off comic strip of The Simpsons? I know it had some sort of one year contract, and since papers dropped it like a hot potato after a few weeks, that 1999-2000 run is very rare. But it was listed in E&P right through 2003. Was there more? Where did it run? * Has anyone else noticed that Denis LeBrun is no longer credited on Blondie? Wha' hoppen? * Okay, here's more of a philosophical question. Why is it that for many years (since the 80s I believe) King Features has offered a special service of strips for weekly papers (like The Spats, RFD, Mama's Boyz and Amber Waves), but they've never listed them in Editor & Publisher, never mention them in their advertising, don't feature them on their website? They got cooties, or what? Dadblame it, your right Stephen. I misread my notes. Ed Jurist is credited as writer on the final weeks of the strip (replacing one Lafe Thomas). Even curiouser, I say. Why bring in a new writer just as you're killing the strip? did the Aug. 29 - Sept. 3 dailies. did the Sept. 5 - Sept. 10 dailies. dailies since Sept. 12, 2005. Sept. 4, 2005 anniversary strip. but Jeff Parker quit with Lebrun. not giving Marshall a credit. from Sept. 5, 1999 - Sept. 3, 2000. 2003, this was a 1/3 page feature. Both runs syndicated by UPS. I need verification of all the above. Re: Blade Winters: I have Ed Jurist as a signed writer on the 1952-12-38 Sunday, so it may have been a case of late acknowledgement by the paper. Here's another of those great newspaper magazine cover comic strips that I discussed back in this blog entry. Babs In Society is from much earlier, back in the heyday of the form. It started in January 1927, and probably lasted a month or two (unforunately I have just a few examples from the series). This series has both the writing and art credited to Virginia Huget, who, as I mentioned before, was one of the more prolific creators of these special strips. Can anyone supply definite running dates to this series? If I haven't mentioned it before, and I'm sure I have, I really love the World Color Printing syndicate. I even made a special trip to St Louis a few years ago to research the history of the company. Didn't find out a great deal. One thing I did learn was why they lost interest in their syndication business in the 1920s (it really nose-dived). Turns out they got the contract to print The Sporting News, a national weekly sports newspaper. The windfall of that contract seems to have ended their interest in providing a low cost Sunday comic section to small papers. Anyway, today we have one of their earlier efforts. 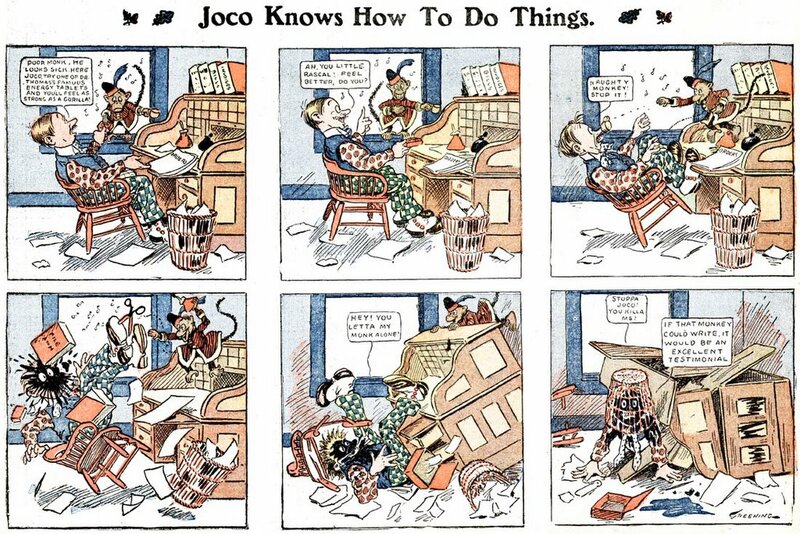 Joco And Jack started, as best I can tell from cross-referencing partial Sunday sections, on July 10, 1904. It was drawn by H.C. Greening. This seems to be the only installment he did, as the next known example is from July 24th, and the mantle has been passed to Ed Goewey. Goewey created new episodes on a semi-regular basis until September 11th. Then, on October 2nd we get another artist change, this time to someone signing themselves something like 'Jarrant'. The signature is all but illegible and I could be way off on that name. Goewey returns on November 13th, and the last known episode of the strip runs on December 25th. Our sample today is the first installment from July 10th. correct? What about McClure? others? Actually, WCP and McClure both began syndicating their material in 1901. The earliest syndication of Sunday comics material that I've found is all the way back in 1898, when the NY Herald began syndicating their Sundays to the Philadelphia Inquirer (and perhaps others). Since 1904 the NEA syndicate (NEA stands for Newspaper Enterprise Association) has provided a daily package of features for newspapers. Along with their regular menu of comics, columns, editorials, news stories and photos, they often add special bonus items for their subscribing newspapers. One of their popular bonuses used to be short run closed-end comic strips. Often these strips commemorated a holiday (NEA still distributes a special Christmas series each year), others graphically discussed hot topics in the news, or tales from history. These specials had their heyday in the 40s and 50s, when NEA was issuing them quite often, as much as three or four per year. Here we see the first episode of Generals Who Became President, a graphical history of, well, what the title says. This was a particularly short series, running just seven episodes from 1/12 - 1/19/1953. Most such special offerings lasted 2-4 weeks. This series was timed to run the week before the presidential inauguration of one Dwight Eisenhower. Art was by Ed Kudlaty, story by Ray Ellis. Surprisingly enough, many subscribing papers did not run these specials, making them very tough to document for Stripper's Guide. Ironically, the newer ones are the toughest to find. Even the otherwise excellent NEA archives housed at Ohio State University's Cartoon Research Library has few of these special strips represented. That should probably be 1953, the year Eisenhower took office. Thanks Joshua for pointing out the typo. The strip did indeed run in 1953. Sorry for the mixup! my grandfather Ed Kudlaty worked for NEA for many years. he was a phenominal artist and i have many of his comics/drawings at home. I'm sure eveyone reading the blog would love for you to share some info about your granddad. According to my records he contributed the art on just three of these closed-end strips. What other work was he doing at NEA, and did he do cartooning elsewhere as well? from what i gather he did a little bit of everything during his time with NEA. always doing his own art on his own time. in addition he had a portrait of pope pius XII that was the cover of time/newsweek(cant remember which). i believe it was in 58. after the closing of the cleveland nea branch and subsequent early retirement he continued with watercolors (think french impressionist stye), oils and woodcarving until his death in 2007 at the age of 91. Ironically, I worked with Ed's grand daughter in early 04-05. I bragged about a beautiful snowy farm type painting the my siblings argued about "who would get" that hung over the fireplace. It turns out Ed shared the same house number a couple of streets away as my in-laws. My father in law worked for several newspapers wrote "Woman's Wear Daily" at some point in time. Ed & dad founded the church in in their neighborhood. I showed Ed's grand daughter the painting and she said "Oh yes, that's my grandpa's painting." She told me he put tons of artwork in the attic and was focusing on wood carvings, which I can only image are terrific! BTW: The beautiful painting is now hanging over my fireplace!